Athens based architectural office MABarchitects was commissioned for the interior reconstruction of a 200 square meter flat in the city center of Athens // GREECE. The architects were commissioned to design and construct a gynecological clinic which specializes in assisted reproduction. Most of the flats in the Athenian city center have been converted into offices, health centers and similar programs. 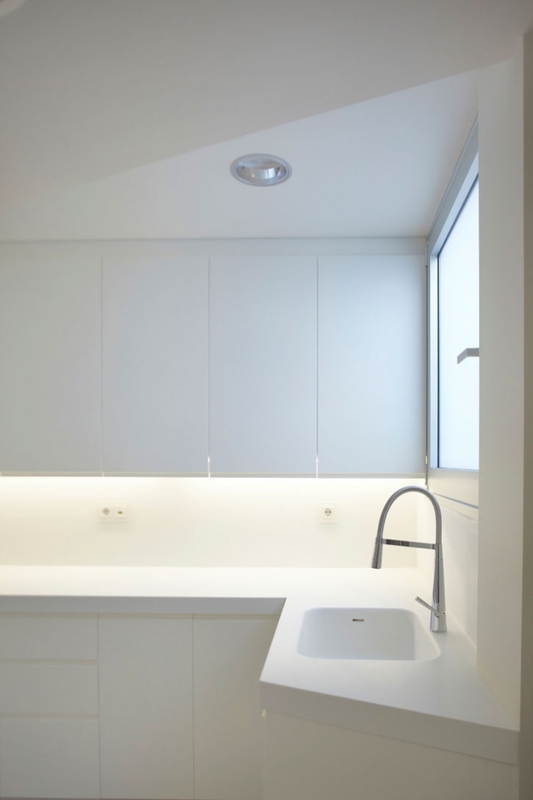 MABarchitects redesigned the interior of the flat having in mind a positive and calm environment which will assist the mother-to-be in conceiving a baby. 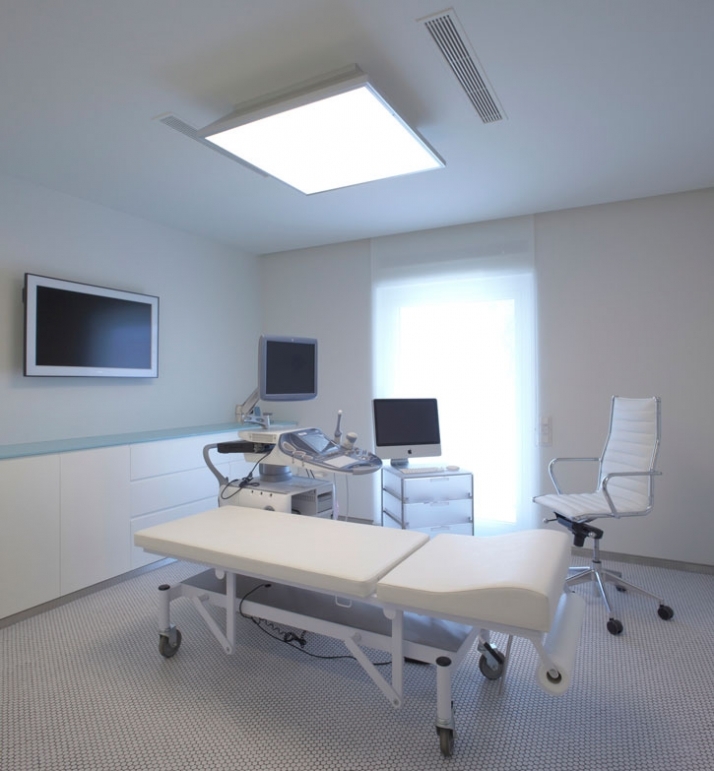 Such a serene environment also assists the high tension and strenuous task which the gynecologists have to carry out. 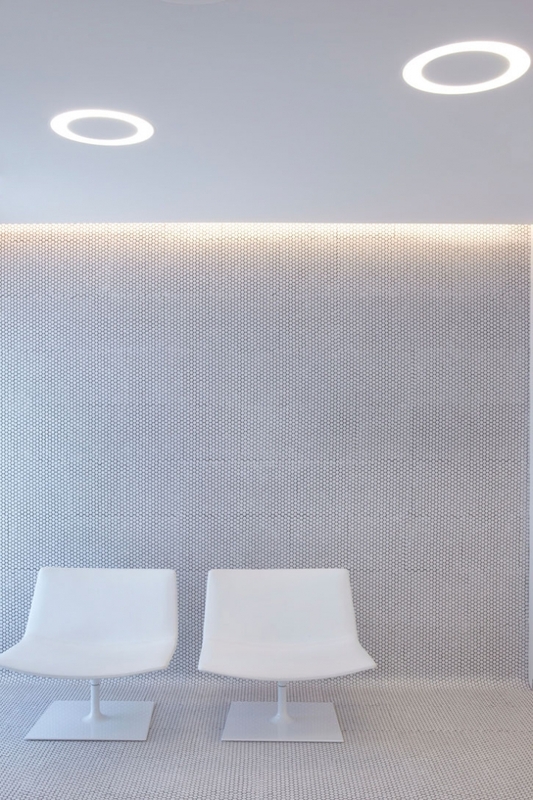 It is very important to design for the end-user and MABarchitects managed to do so successfully by clearly understanding the needs of the clients // gynecologists and their patients. For the construction phase, contractor, Antonis Dounoukos who did a magnificent job while paying close attention to detail, gutted the flat including all installations as well. All new wiring, plumbing, and central air installations are hidden behind the wall cladding, ceilings and the new flooring wherever necessary. 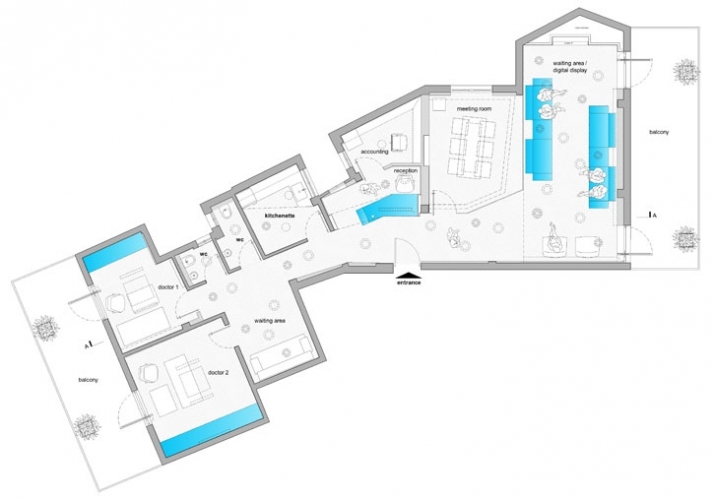 The layout of the 200 square meter flat was divided into two doctors offices/examination rooms, two waiting rooms, two wash closets, a kitchenette, a reception, an accounting office, and a conference room. The choice of the material and their cellular-like structure subconsciously makes reference to the nature of the work performed in the surgery of the conception process. Furthermore, one may make perceive the fluorescent ceiling lights as an ovary or an embryo due to their shape. Partitions and wall claddings are made of special translucent sandwich panels, made of two sheets of Perspex and the in-between gap, which is filled with plastic straws of different diameters. The material and the way it has been constructed allow for amazing effects and change the level of transparency depending on the viewpoint. 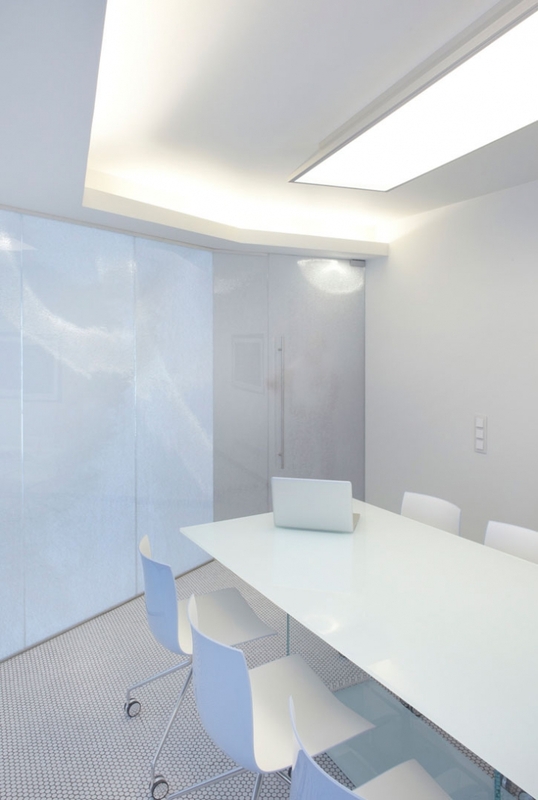 The architects have allowed and aimed at designing an area with ample of natural lighting which surpasses the transparency of the materials and reflects off of the white surfaces. Apart from the natural lighting the hidden fluorescent lighting creates a cozy, relaxing and modern atmosphere. The architects have metaphorically created a moment where the glossy white plaster ceiling (or uterus) is randomly pierced by seemingly floating circles of light or circular air vents (embryo) which clearly represents the process of the minor reproduction surgery which is performed upon the mother-to-be. 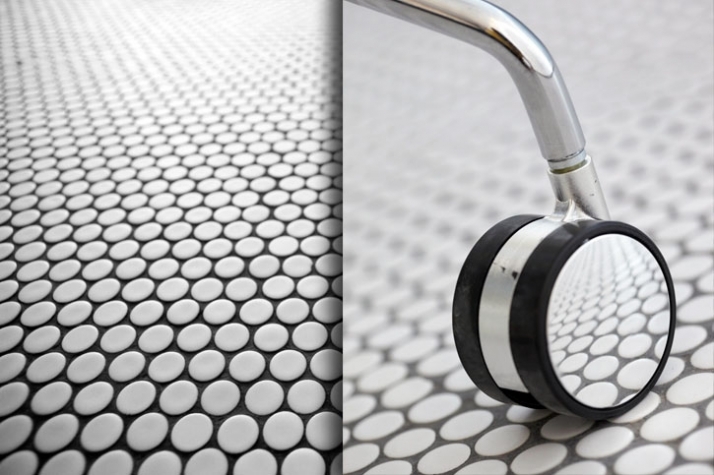 The floors and occasionally some vertical wall surfaces are covered with white round mosaic tiling, apart from the wash closet which happens to be in black circular mosaic tiling. 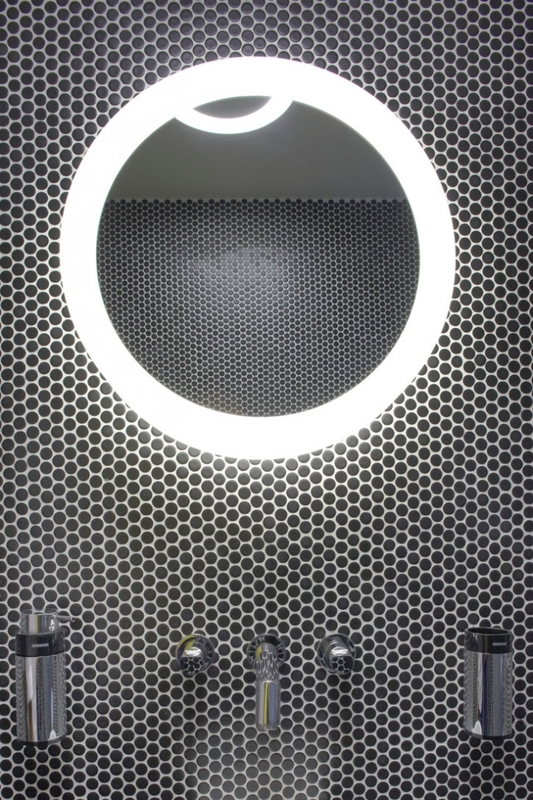 All furniture and fittings were carefully chosen to enhance the overall appearance of the clinic. 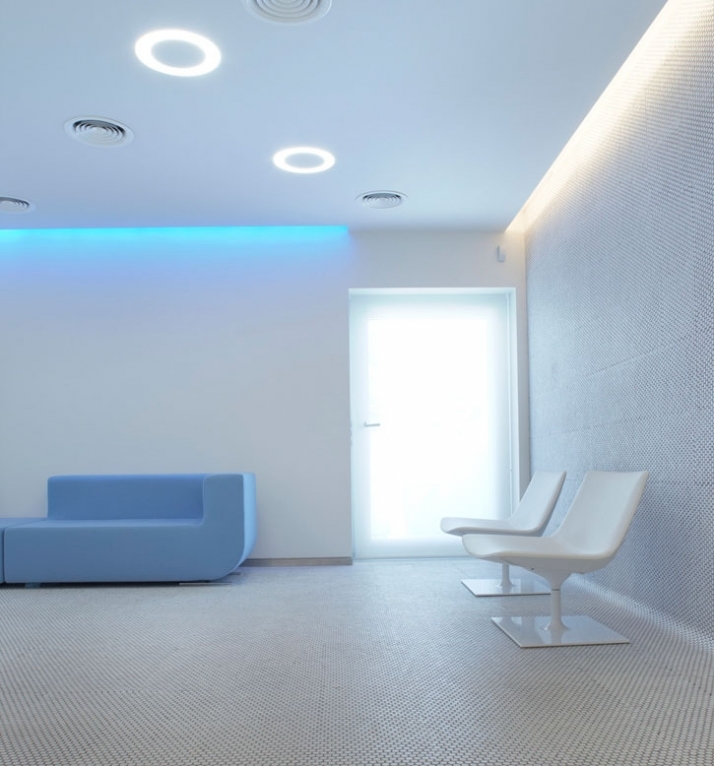 The concept of the project was to provide a cool but friendly clinical environment. The predominant color is white with just few sculptural pieces of furniture in summer-sky blue. Overall, on understands from the above description that the choice of materials with cellular structures is a reference to the nature of the work performed in this surgery. The end-user // gynecologists and their patients // are happy with the end result and hopefully the new serene environment will assist more women in conceiving a baby. MABarchitects is an interdisciplinary collaborative led by Rena Marioli, Franky Antimisiaris and Branko M. Berlic. MABarchitects operates as a ltd. company based in Athens. The main scope of operation covers design, architecture, urbanism and furthermore construction and development of real estate.